Pets are welcome on this property. There is a $25 cleaning fee per pet. We are located at 691 1st Avenue in Ketchum. Coming from the south, turn left off Highway 75 onto 5th Street just before the Veltex convenience store. Drive two blocks and turn right onto 1st Avenue. Drive two blocks, turn left onto 7th and look for the two green garage doors on the left. Park to the right of the first green garage door (closer to the mountain). Coming from the north, turn right onto 5th Street off of Highway 75 and continue to follow the rest of the above directions. Come and enjoy the two cozy and heated treehouses in the heart of Ketchum, Idaho. The neighborhood is quite quiet, yet it is a short walk to most restaurants, theater and nightlife. Going the other direction, you are a short walk to the park with playground, tennis courts, bike park, winter ice rink, soccer fields, river, swimming, skateboard park and YMCA with indoor pool, waterslide, fitness center and world-class climbing wall. Fifty yards away is the bike path with connections to about 35 miles of paved bike trails. Basically, enjoy the great outdoors and the arts, dining and culture of Sun Valley all right outside your door. Treehouse Ketchum even has free bikes you can use to explore the area. 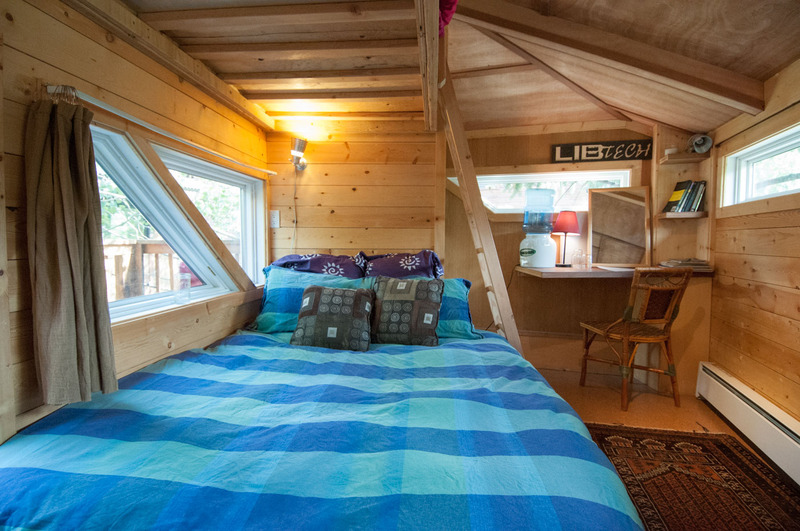 The space is 125 square feet, with just under a queen-size bed and a single-bed loft. The bathroom is complete, with a nice hot shower, toilet and sink down the ladder and 20 steps from the treehouse. In winter, you have to walk through the cold to get there, but the bathroom is also nicely heated so the cold doesn't have a chance to seep in. In warmer seasons, it is like a really close camp bathroom. The yard is complete with urban-woodsman camp kitchen, featuring propane stove, gas grill, conventional oven, coffee grinder, french press, small electric fridge and running cold water in the warmer months. Winter is great for skiing, snowboarding, cross-country skiing, pond hockey, snowshoeing and most other winter activities—or relaxing in front of a warm fire at a cozy lodge or bar. There are also natural, outdoor hot springs that are great for a soak.